Oh great. There’s more Christmas Radio than ever this year. Smooth Christmas is back from its snowy grave, there’s Christmas Carols Radio – and Free Radio 80s has been bumped for the Festive season. And the good citizens of Stoke and Bradford have new UTV stations on DAB and online. We listened in to Signal Christmas. ID: Dave Johnson from Signal 2 Christmas anecdote about brown turkey and sprouts. Song clip “Its the most wonderful time of the year.” VO: This is Signal Christmas. ID: We love Christmas so much, we’ve made a Christmas radio station. Signal Christmas. 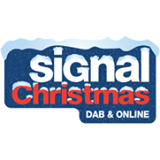 ID: Playing the best Christmas Classics 24 hours a day, Signal Christmas. ID: This. Is Signal Christmas. ID: Your 24 Hour Christmas Station. Signal Christmas. Mariah is a banker for a 0700 switch on, but it’s hard to believe anyone, even someone who wears a Christmas jumper in August, would ever say, “Great, In Dulce Jubilo is on the radio again.” I’m not sure Dina Carroll should make an outing until 26 Dec-2 Jan, alongside Abba, natch, and the Pretenders wrote the all-time best Christmas song (and it ain’t this one) but those are minor quibbles. And on a music-driven, background station like this, surely a few nice VO-less old school segues would help it breathe a bit? Yes. They post one of these on their Facebook EVERY day. In fact, the imaging is a bit whatever. The presenter soundbite is a clever way of bringing in voices from the parent station, and adds a bit of colour. The main issue with the IDs is they’ve used growly VO man whose delivery is exactly the same as if he’s reading for Testosterone FM. It’s Christmas, guys. Lighten up a little. What so many Christmas stations still fail to get is that tonally, it’s a time of warmth and connection. Hard to achieve that from a computer in a cupboard, without a little clever voice-tracking. Last Christmas I gave you my I reviewed Ireland’s Christmas FM and wondered whether there was enough good/familiar Christmas music for a Christmas Radio station. A year earlier, I berated Smooth Christmas for sounding strangely cold. Here’s a little Christmas station that’s getting a little more right. Happy Christmas. This entry was posted on Wednesday, December 10th, 2014 at 7:39 am	and is filed under Uncategorized. You can follow any responses to this entry through the RSS 2.0 feed. Responses are currently closed, but you can trackback from your own site.